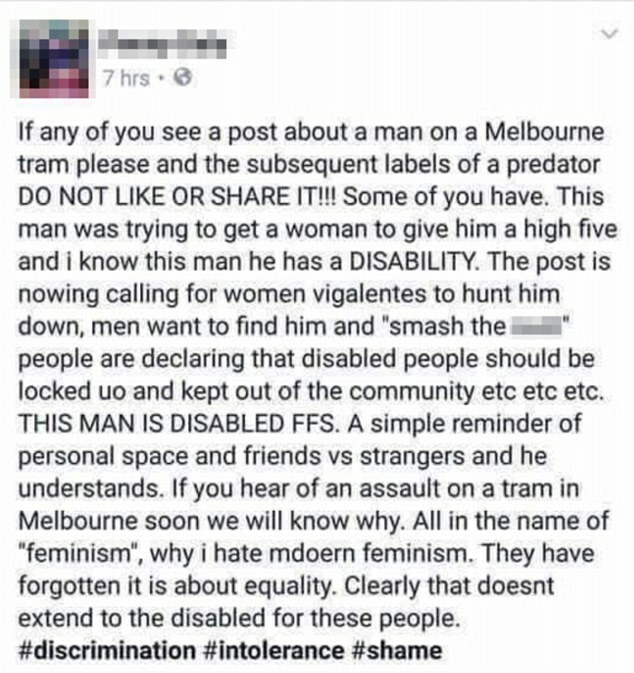 A man who was publicly shamed online for being a 'festering turd of a human being' that 'intimidated multiple young Asian women' by waving his hand in their faces on a Melbourne tram is reportedly autistic and loves to high-five strangers. The man's face was plastered across social media when a woman took a photo of him and wrote a status labelling him a 'low life', 'creep' and 'loser' on Facebook. Her expletive-laden post attracted 80,000 likes and close to 10,000 shares in a matter of hours, with many people leaving aggressive messages threatening violence and revenge on the alleged harasser for his 'dominating' behaviour. But multiple sources have since told Daily Mail Australia that the man is a regular commuter along the city tram line who is reportedly autistic and 'wouldn't hurt a fly'. 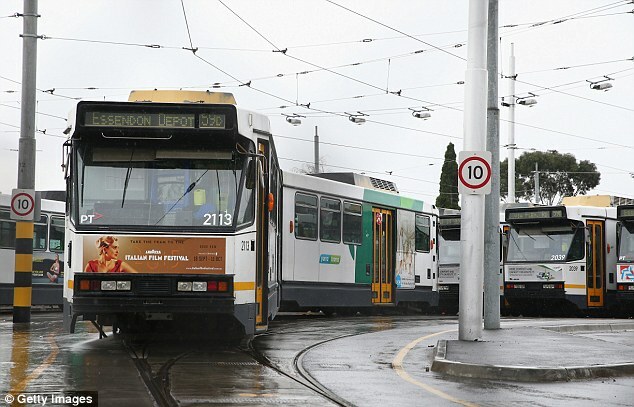 'I have seen him on the same tram for years along Swanston and Elizabeth street,' one man told Daily Mail Australia. 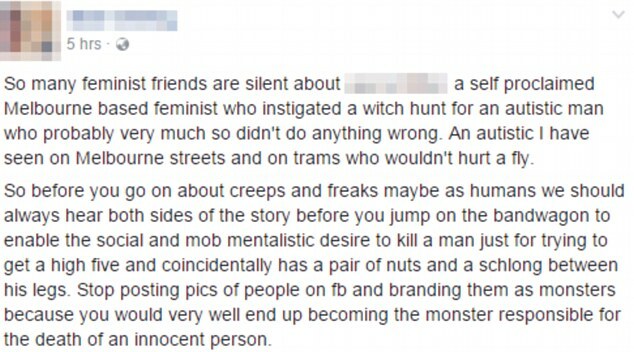 Another person pleaded with social media users to stop calling the man a predator. 'This man was trying to get a woman to give him a high five and I know this man he has a disability,' she wrote online. 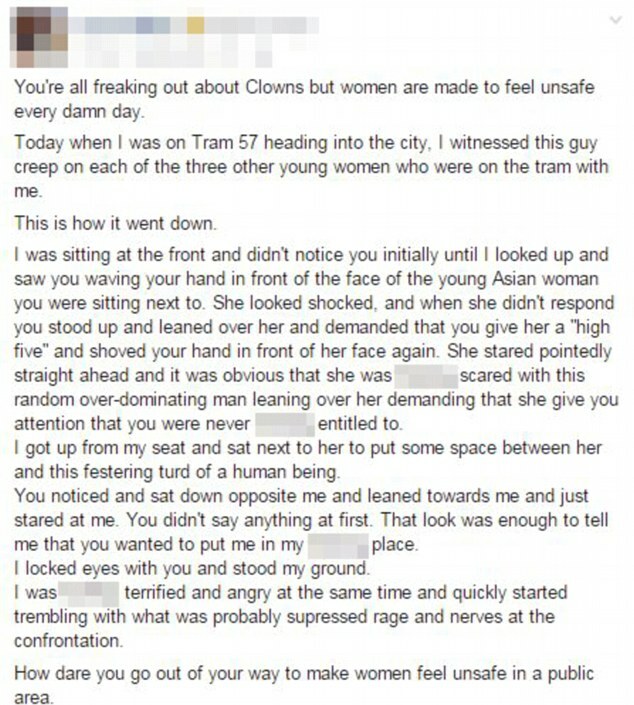 The woman's original post, which has since been taken down, described how the young female passengers were allegedly made to feel afraid by the man's actions. 'You went and sat down next to the other young Asian woman and when she got up immediately and moved seats, you followed her,' she wrote. 'You sat down across from her, legs sprayed across the seat in an attempt to invade as much as her personal space as you could while leaning towards her. 'You made her feel uncomfortable and unsafe, and you violated her personal space because you felt entitled to it,' she said. Social media has remained divided over the story, with some people suggesting that the man's mental condition does not excuse the way he reportedly behaved on the tram. Others have shamed the woman for taking a photograph of his face without consent and then publishing it online, facilitating discussion that quickly turned aggressive. Daily Mail Australia has contacted the woman for comment.